The objective of this project was to develop methods to measure the degree of interoperability as a result of data sharing and use between users of certified technologies who are eligible for Meaningful Use (MU) incentives and non-incentivized Trading Partners (TPs) using non-certified technologies. Given the early and evolving technology stage for many TPs, there is a key window of opportunity to develop and implement measurement methods that capture interoperability trends as they accelerate, identify best practices in sharing information, and promote policies that support innovative exchange. 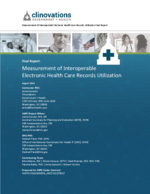 Expanding the scope of interoperability measurement is critical as efforts are being made to enable health IT and exchange capabilities beyond the focus of the CMS EHR Incentive Program. Thus, effective patient care will need interoperable access to data generated by providers who were not incented by MU.